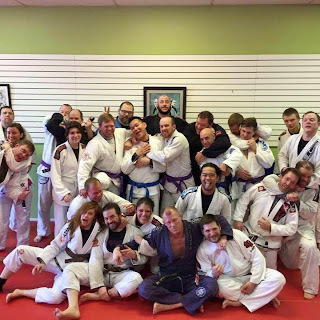 I have been training in a martial art called Brazilian Jiu-Jitsu for a little over a year. It is excellent exercise and teaches the practical skill of self-defense. Through the strenuous 90 minute classes two or three times a week, I have lost 15 pounds, increased my strength and endurance, and mental toughness. 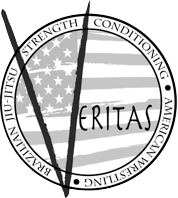 The encouragement and accountability of my teammates at Veritas BJJ in Dalton, GA makes all the difference. They keep me going. I keep them going. We keep each other going. This article is about how I took off an additional 12 pounds in 6 short days to prepare for my first BJJ competition. To read about my fight, click here. I am not a fan of fad diets--especially crash diets. My philosophy is eat healthy and in modetation and exercise hard. There aren't any magic pills or shortcuts. Do the work and enjoy the results. However, I found myself weighing 205 pounds one week before my first BJJ competition and I didn't like the weight brackets for my age group. For a man my age (41), the weight division was set for 200 pounds and up. What that means is any man older than 35 and over 200 pounds would be in my class. So I could potentially be fighting guys who were 250, 300, 350 pounds, or even larger. I sometimes roll (or sparr or wrestle) with guys that big in my training class. It's great training, but a serious and obvious disadvantage in a competition setting. The next lower weight bracket for my age group was from 180 pounds to 199 pounds. Man, that was so much more attractive to me. Couldn't I just loose 5 more pounds and make that weight division? Thanks to some encouragement from one of my training partners, Vince Caggiano, I decided to go for it. I got online and researched several weight loss plans and decided on one an MMA (mixed martial arts) fighter named George Saint Pierre uses to cut 20-30 pounds in a week before his fight. I didn't need to lose that much and didn't want to risk my health or deplete my energy, so I decided to modify the plan and make it milder. Furthermore, I'm a pastor, a husband, and a father and I needed to be able to function normally in the real world. My modified plan worked for me. For the full plan and a discussion about how it works and how it affects body performance, click here. My goal was to loose 10 pounds in 6 days without damaging my health or depleting my energy. That was a few more pounds than I actually needed to drop, but the extra pounds would be a buffer in case the official scale was a few pounds off from mine. I hoped the milder diet plan wouldn't sap my energy too much because I would only have a few hours to rest and rehydrate between weigh in and my first fight. The idea is to drink a lot of water at the beginning of the week so your body starts flushing fluids. Then, you start drinking less water toward the end of the week, but your body keeps flushing. You also limit salt intake, which helps your body let go of more water. Here were the goals I set for my one week plan. After weigh in - sip up to 1 liter gateraid or water per hour and eat a satisfying amount without filling up too much to competcomfortably at 1:30 AM. It's good to have a plan and they look great on paper, but real life is messier (especially as a pastor). Here’s what my week actually looked like. I wake up and realize we are having a covered dish luncheon after church today. It's gonna be tough to stick to my plan today. After my morning shower, I weigh 205.0 pounds. I fill up my Pleasant Grove UMC water bottle full of 20 onces of water. I can use this to keep track. I decided to skip breakfast to limit calories in case I indulge a little at lunch. Also, I realize almost all my breakfast food is full of carbs. For lunch, I have a fried chicken breast, green beans, pinto beans, and some broccoli. I skip all the yummy looking cream corn, bread, and other carby sides. I do get a small brownie (can't resist). No sweet tea for me. It's water only. I know the fried chicken breading has carbs and there's salt in there too, but I'm not going to be militant about this diet. I live in the real world. Besides, this is half as much food as I would normally eat at one of these church feasts, which are both a perk and a curse (for the health) of a Methodist pastor. The hardest part of the meal were the wondering eyes of my parishioners wondering why I was eating so little or why I didn't get a serving of their famous such and such, but my church folks are gracious people. For dinner, I had a left over piece of chicken breast they let me take home. At the end of the day, I came up short on the water. Two gallons seems like a lot to drink. I'll have to do better tomorrow. Other than that, this isn't too hard. It was interesting to me to note that I would lose 1 to 3 pounds each night while I slept. I weigh my heaviest at night hefore.bed and lightest in the morning. After my morning shower, I weigh 202.6 pounds. I decide skipping breakfast is easy enough and will save me a few calories. That will be my plan for the week. I get started right away on my water and have 30 onces down before I even get to work. I'm gonna make the goal today. I have lunch at the Engine Room with my mens Emmaus reunion group from church (spiritual accountability). I have baked chicken, green beans, blacked eyed peas, and broccoli. For dinner, I skip the lazagna my wife made for the family. Instead, I cook a boneless chicken breast on a George Foreman grill sprinkled with curry, onion powder, and garlic powder. No salt added, but it tastes salty so I'm thinking they added salt water to this chicken breast before they froze it. There's no salt in the spices I added so far as I can tell. I met my water goal today. It wasn't that difficult. 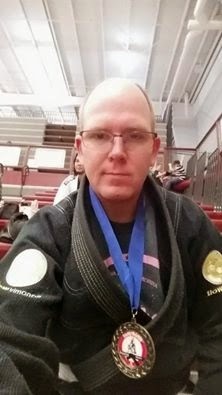 I had to miss my BJJ class tonight so I could attend my son's awards ceremony at his school. Real life here. After my morning shower, I weigh 199.6 pounds. (This is the first time I've been below 200 lbs in about 15 years!) Same plan: No breakfast. For lunch I have a grilled chicken house salad from Zaxby's. There's probably more salt in there than I'm supposed to have, but at least it's not a hamburger and salty french fries. I have a funeral to lead today. They are having a meal for the family afterwards. The pastor is usually at the meal (perk and curse, remember). I have a fried chicken wing, 2 deviled eggs, and some grean beans. No dessert (that was the hardest part). Folks, church dinners are the best dinners on earth. Everyone brings their very best so you're eating the best of the best. If you aren't going to church, do yourself a favor and start today. Food evangelism. It's a real thing. After the funeral, I got called in to do some difficult pastoral counseling at the hospital. It was a late night. I stopped by the grocery store and bought a t-bone steak, some cauliflower, and broccoli for dinner. I put onion powder and garlic powder on the steak and grilled it on the George Forman. I steamed the broccoli and cauliflower--no salt on anything. The steak is good, but bland. The veggies are satisfying. My appetite has shrunk considerably. I am full and satisfied after the meal. My unexpected pastoral care at the hospital required me to miss BJJ class again. I'm glad to serve, but hated to miss the training time. I hope this doesn't effect my weight loss or competition performance. My weight after my morning shower is 198.4. I skipped breakfast again. I had yet another Zaxby's grilled chicken house salad for lunch. I keep thinking of branching out, but I go right past there on the way to do hospital visits and I like them and they fill me up. We have dinner at church on Wednesday nights and my training partner, Vince, is the cook. The menu is buffalo wings, pigs in blankets, homemade french fries, celery, and carrots. I have 5 wings, celery and carrots, and skip the fries and dessert (arrgggg!). Latter that night, I have a leftover hamburger patty for a snack (no bread). Drinking the water has been easy. I easily make over 2 gallons. I think it may be tough to only drink a gallon tomorrow. Before bed, I take my first hot, Epsom salt bath. I'm a little chilly tonight so I'm looking forward to it. This is supposed to help my body shed extra water. The water is hot! I'm just barely able to submerge myself. After 10 minutes, I'm done and my heart is pounding and I'm hot. It takes a while to cool down enough to go to bed. I'm half a pound lighter after the bath. Weight is 196.4. No breakfast. You guessed it, Zaxby's salad for lunch. Home for dinner, I have a hamburger patty and left over steamed broccoli and cauliflower before a 90 minute, no-gi BJJ class (no-gi means we don't wear the traditional martial arts uniform, just shorts and a t-shirt). Today I'm only drinking half a gallon of water, which has been challenging. My body wants more, especially after the BJJ class, but I am disciplined. I have another hot bath before bed. It is not fun. Weight is 194.2. This is my day off work, but I've got house and farm chores to catch up on. Plus, I'm only supposed to drink 32 onces today. That's gonna be tough. I'm thirsty. The MMA plan suggested the use of a natural diaretic, so I have an idea. I'm gonna drink a cup of black coffee this morning. (It's a mild, natural diaretic that encourages your body to shed water.) I'm not a big fan of coffee (especially black), but that was the best cup of coffee! It's probably because I was thirsty and it was the first non-water liquid I'd had all week. I'm still urinating even though I'm thirsty. I have a late breakfast with my wife of scrambled eggs with onions and cream cheese (no salt). For the remainder of the day, I will consume only 4 onces of unsalted peanuts. The limited food is not too hard. What I really want is to just guzzle water, but I'm only sipping. I dred my hot bath tonight, but I do it. I feel weak and dizzy afterwards. I don't think these hot baths are good for my health. I think I will omit them if I ever use this diet agian. I end the night with a cup of iced, black coffee. It helps cool me off. I take a warm shower and then weigh 192.2. I am thirsty. I can't wait for weigh in so I can drink and eat. Between the time I wake at 6 AM and weigh in at 9:45 AM I will sip through about 12 onces of water and eat a small, 100 calorie granola bar. I feel a little weak, jittery, and uneasy, but the limited food and water eases me. At this point, I'm worried if this is going to adversely affect my competition. After a 2 hour drive, I weigh in at 194.6 pounds wearing a pair of shorts, t-shirt, and flip flops. Boom! I count it a success! Now, time to drink and eat. I open a 32 once bottle of gateraid. I need to be careful not to guzzle. I pace myself as I eat the best peanut butter sandwich of my life, a few salty snacks, and an apple. Within an hour of my weigh in, I need to pee. I will go to the bathroom 4 times before my match. That's a good sign. It tells me, I am rehydrating. I feel settled again. The mild nausea and wooziness from earlier are gone. I'm a little jittery, but I think it's just pre-competition nerves. I feel good and strong and in shape to fight. To read the details of my match, click here. My six day diet was a success. It got me into the weight division I wanted without stifling my performance or hurting my health. Also, it helped me overcome a weight loss plateau I was stuck at For a long time. I've been wanting to get back below 200. I am on a week of vacation right now and I don't have a scale. I suspect I will gain back a significant portion of the weight, if not all of it. We will see. I continue to drink a lot of water and eat a little better--more meat and less carbs. Plus, I am jogging this week to keep burning calories And get ready for an upcoming 5K race. I will update you in a week to see where my weight is after vacation. At any rate, I count this as a success because it accomished all my goals for the BJJ competition and I won 1st place in my weight/age/rank division. To read about my fight, click here. As I said in the beginning, I'm not a fan of fad diets. If you want to lose weight and keep it off, eat right and exercise hard. There are no short cuts. I suspected I would put back on most if not all of the weight I lost. I was right. After a week of vacation, I weighed in this morning at 201.2 pounds. I got plenty of exercise during my vacation--jogging 3 miles twice and rising countless miles on a bike. Also, I didn't eat too badly. Yet, I still gained 8 lbs. I am still happy. I am close to the 200 mark and with a little mindfulness about what I eat and continued hard exercise and BJJ 3 times a week, I may be able to drop and maintain below 200. I hope so, because it's a good weight for me. I started training Brazilian Jiu-jitsu in March of 2014. 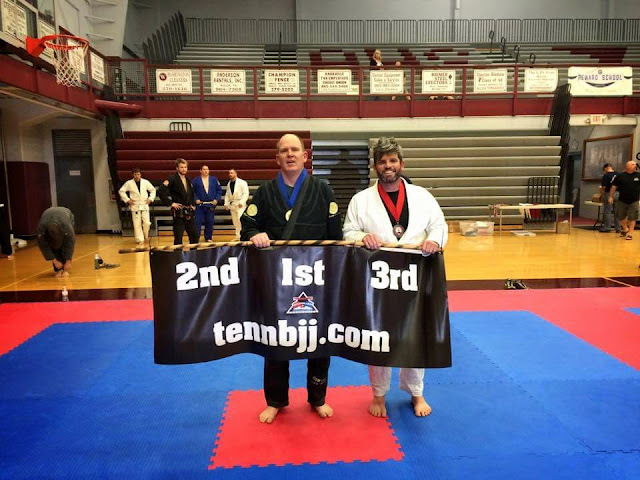 This is the story of how I won my first BJJ fight at the Smokey Mountain Grappling Tournament in Alcoa, Tennessee on May 23, 2015. I only had a few weeks to prepare for the competition and a week before the tournament, I decided to lose 10 pounds and fight in a lower weight division. Click here to read about my weight loss experience, which was a victory in itself. 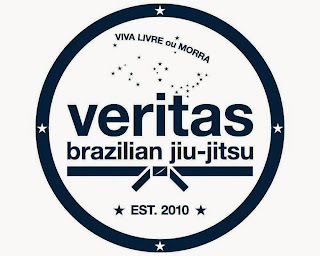 I weighed in at 194.6 pounds at 9:45 AM and began the process of hydrating and getting some energy in my body while I watched my team mates from Veritas BJJ of Dalton, GA compete. I love these guys and gals. They train very hard at jiu-jitsu and inspire me to do my best. If you're in the Dalton area, I highly recommend you give them a try. 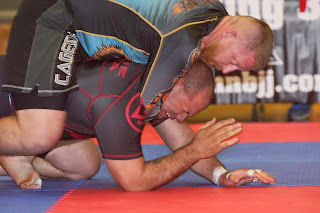 Here's Kevin Bruce winning his no-gi match by rear naked choke. I have competed before in Tang Soo Do competitions and I always have jittery nerves before it's my turn. It's the same way when I preach on Sundays. Even though I've been doing it for almost 15 years, I still get a little nervous before the service starts. I just try to control my breathing, relax, and stretch. It's almost time. Coach Jason pulled me aside to encourage me. "Chris, I expect you to blow through your competition today. Your good and you've been training hard. You shouldn't have any problems. Regardless of what happens, I'm proud of you. Just remember to relax, breath, and stay calm. Don't rush things. Take your time and wear you opponent down before you try any submissions. Establish your dominant position and then hold it until your opponent stops fighting." They call my name. I'm the first one named from my division to fight. I walk onto the mat to take my place in the ring. I close my eyes and say a short prayer to center myself. "Father, help me to do my best and keep me and my opponent from being injured. Please be glorified by what we do here. Amen." My opponent stands across from me. He doesn't look so mean. He's a little smaller than me with salt and pepper hair and beard. I'm glad I lost those 12 pounds so I could fight in this division. We shake hands. The referee signals for us to start. My game plan is not to rush. I'm going to take my time. I will let my opponent try to take me down to the ground, but I will counter him. I'm quick and have great reflexes and I'm usually successful at this. We have just started to clench and fight for grips on each other's gis (uniforms) when the ref stops us and tells us to hold our position. He explains the clock has malfunctioned. I joke with my opponent that we already broke the clock. The kidding blows off a little more steam and helps me relax. In a moment, the ref tells us we can let go of each other and take a break while they fix the clock. 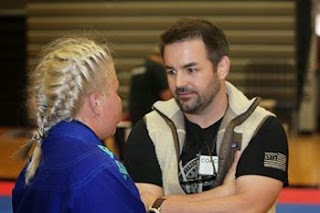 I step over to my coach, Jason, and listen to him remind me to stay calm and not rush. "Make sure you don't concede your grips to him." "Ok, coach. Is it alright if I go ahead and try and take him down?" "Sure. Remember, snap him toward you. Then when he pulls a way, push in. You can just go back and forth like that until you get him off balance..." Coach sits back down and I just pace slowly around to stay calm and loose. The ref calls us back together and decides to restart us from neutral. Only 20 seconds has run off the clock at this point. We touch hands again. "Go!" Almost immediately, my opponent tries to take me to the ground. It is sloppy and he hasn't done anything to break my balance or posture. As I expected, I can easily counter him and follow him down almost immediately into side control. This is one of the most dominant positions for me. My body is on top of his and I'm perpendicular to him while he is flat on his back. All my weight is pressing down on him. He's burning way more energy than me just to breath and there's very little he can do, while I have a multitude of options to try and submit my opponent. I remember coach Jason's advice earlier that morning, "Chris, don't rush. When you get on top, relax and take your time. Hold the position and let your opponent wear out. When he starts to settle down, then go for the submissions." That's what I'm gonna do. I press my shoulder into his face and drive all my weight down while trying to counter any movements he tries to free himself. I hear coach call out from the corner, "Relax Chris!" I relax my muscles and slow my breathing. I don't want to burn myself out. I'll leave that for my opponent. He's tiring and slowing down. I feel his frustration, because I've been in that position before. He starts to settle down and I see him looking towards his corner for advice from his coach. Time to make my move. I will attack his left arm and try a shoulder lock. He's fighting hard because he knows what I'm trying. He's slipping his knee up under me, trying to hook my leg and pull me into half guard (still a dominant position for me, but an improvement for him). I fight it off and press my weight back into him. I go for the shoulder lock again, but he's defending well and trying to regain half guard. I'm fighting it off, but now he's framing up (this means he is using his forearm and elbow to press into my chest and face to keep me from putting pressure on him). He's fighting valiantly and creating space between us so he can maneuver. Now I'm having trouble isolate his arm for a shoulder lock. He finally slips his leg in and pulls me back into a half guard and I don't fight it off this time. It's time to go for something I've been working on and has been working for me a lot--an Ezekiel Choke. 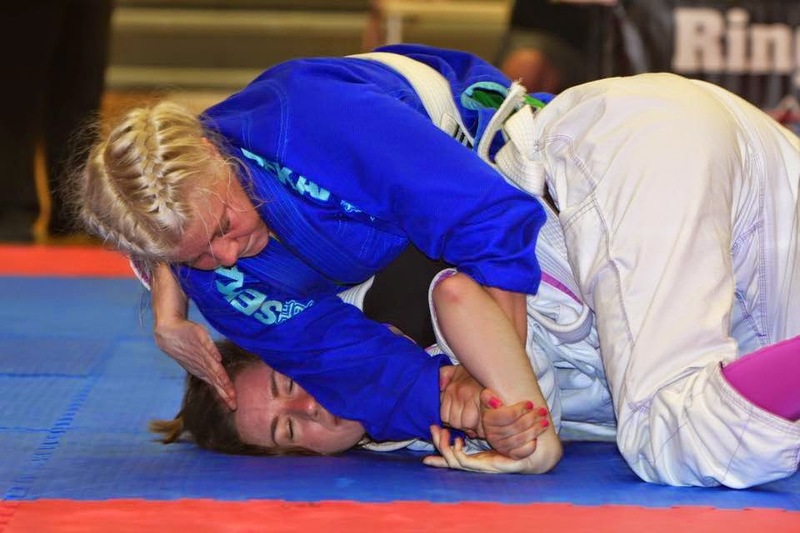 I settle into half guard on top of him as I slip my left arm around the back of his neck. He is feeling relieved at having finally removed the pressure of my side control. I'm hoping to capitalize on his false sense of security in this situation. Secretly, I grab my right sleeve cuff with my left hand. Then I slip my right hand in front of my opponent's throat. Now I scissor my arms and apply pressure to his throat, but I'm not in good position and he rolls over while I'm trying to choke him and I end up on my back with him on top and I have him in guard. The choke isn't placed right so I let go. Now I'm on my back with him on top. I have him in my guard with both my legs around his waste, so he can't apply pressure. This is actually a more dominant position for me, though the lay person wouldn't know it. I have a multitude of ways to attack him from here while he has very little. However, I don't like fighting from this position. I still have a lot to learn. My coach knows my fighting style and calls out, "You've gotta sweep him, Chris!" 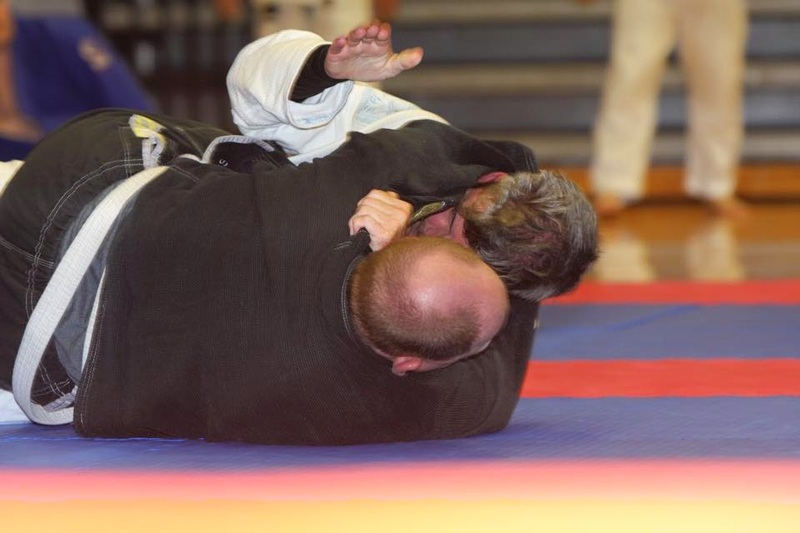 I get my grips on my opponents lapel and attempt a scissor sweep to flip him over on his back to put me on top of him, but he counters and he doesn't go all the way over. I hear my coach yell, "Back up to your feet, Chris!" I scramble back up to my feet and we are standing again, gripping each other’s gis. Almost immediately, he tries to pull me down into his guard. Again, his technique is sloppy and he doesn't break my balance or control my posture. I easily counter him as we go down and I pass his guard--this time to the opposite side. I'm glad I've been practicing side control from both the left and right side. As I press my shoulder down into his face, I think "See buddy. I can do this either left or right handed." I go for the shoulder lock again (Note to self, I really need more submissions in my tool bag. I know what to work on.) I get his arm isolated, but he's fighting hard again. My coach is giving instructions on how to complete the submission, but the opposing coach is giving instructions on how to counter it. After a few minutes of struggling, my opponent slips his leg in and drags me into half guard again. We break apart and the muscles in my arms arm burning and I'm breathing hard from exertion. I think there were only about 30 seconds left in the fight. We went for seven and a half minutes and we both feel it. I hug my opponent and congratulate him on a good fight. I shake his coach's hand and then go back and thank coach Jason. My opponent hugs me again and says it was a great fight. "How old are you?" I ask. "41." "Same as me," I say. "Us old guys can still fight!" I say. "What was your weight?" "185," he says. I'm glad again that I dropped the weight to fight in this lower weight division. "What's you name?" "Shawn." I thank Shawn again for a great fight. At this point, I'm thinking I need to catch my breath because I'll have to fight my next opponent in a few minutes. The ref calls for the awards banner and I realize Shawn and I were the only two fighters in our division, so there won't be anymore fights. I got off easy today, but I'm proud of my first fight. I fought well and executed my fight plan perfectly. I could have fought more people, but was glad to have my first competition behind me as a win. 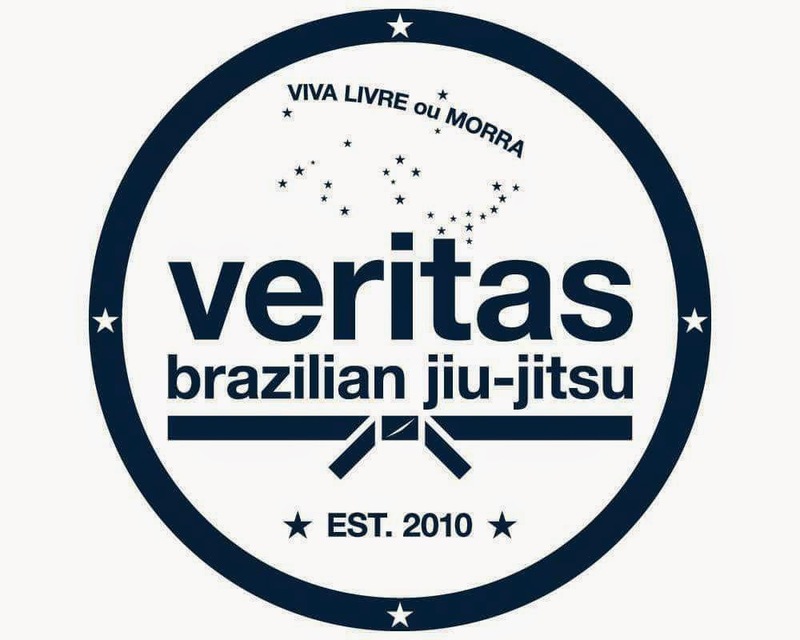 Click here to learn more about Veritas Brazilian Jiu-Jitsu where I train. Click here to learn how I lost 12 pounds in one week to prepare for my fight. I Have a NEW Purpose! I thought I married a lady named Kelly. But ever since we had kids, I keep hearing her called by different names. First it was mama. But then I started hearing her called other strange names that almost sound like African names. It started with: mama-can-I (Mama-can-I have a snack? Mama-can-I go to my friends house?) And then came Mama-buy-me (Mama-buy-me an ice-cream. Mama-buy-me that toy.) And then there another I even use a lot: Mama-wheres-my (Mama-wheres-my shoe? Mama-wheres-my car keys?). And it's not just women or mothers who define their identity by the roles. Men’s define themselves as: son, athlete, student, worker, husband, father, provider... And both men and women are often shaken to their core when their role changes. They can feel as though they have lost their identity. God wants to give you a NEW purpose that transcends your roles, your stages of life, where you live, how much you earn, your standing in the community, etc. What is your NEW, transcendent purpose? This passage explains the NEW purpose Jesus gives each of us. His words are known as the “Great Commission.” After Jesus rose from the grave, before he ascended to heave, he commanded his followers to preach the Good News to everyone in the world. The Good News is that God loves us and wants to save us from our sin. And if people repent and believe the Good News, they will be saved. The most common version of the Great Commission is found in the Gospel of Matthew, but I really like the way the Gospel of Mark puts it. Mark is very simple, straight forward, and even blunt. What Jesus expect is very clear. Go preach the Good News to everyone. · Go – You don’t necessarily have to go far. Some will go around the world in order to make sure everyone hears the Good News. But there are plenty of people right here in Dalton (even here in our church, even in our own families) that need to hear the Good News. Are you willing to go to them? · Preach – This doesn’t mean you have to stand up in a pulpit in church and preach. You have to get up on a soap box on the street corner either. To preach means to proclaim. It has been said, “Preach the Gospel at all times. Use words if necessary.” You should use words, because they communicate ideas most clearly. But don’t just stop with words. Use everything method you can to convey the Good News. This week at the church, we've been hosting students from Coahulla Creek High School in our fellowship hall. They needed a place to take their AP exams. After completing a year of AP studies in various courses, they take the examine. If they score high enough, they can get college credits. As they were coming in Monday morning, I thought 'What can I do to "preach the Gospel" to these students?' The answer was simple. I made a sign to hang on the door as they entered that said "Welcome to Pleasant Grove United Methodist Church. God Loves You! Good luck on your AP exams." You see, you don't have to hit people over the head with a Bible to preach the Gospel. You just help them see how much God loves them. Some people don’t feel qualified to “preach” the Good News. If you believe in Jesus, you are qualified to proclaim the Good News, you have the authority because Jesus authorized you. You are qualified because—if you are truly a Christian—you know Jesus personally and He has made a difference in your life. You have the right to share what He has done for you. In fact, no one is more qualified to tell your story than you. And if you don’t tell it, part of the full testimony about Jesus will be missing. · To Everyone – to children, to teenagers, to young adults, to older adults, to seniors, to Mothers and Fathers, to co-workers and friends and neighbors and the strangers you meet in a store. To people who are easy to like and people who nobody likes. To gay people, straight people, married people, single people, good people, bad people, and people just don’t care. To people who look like you and people who look nothing like you. To people who speak your language and people who can’t understand a word you say. Everyone includes a lot of people—it’s everyone! I almost omitted these verses 17 & 18 from our study because I didn’t want you to get distracted from the point of the passage. The point is to Go, Preach, the Good News, to Everyone. But, we need to address these difficult verses because people often misuse them, abuse them, or misunderstand them. Mark says we will cast out demons, speak new languages, handle snakes, drink poison, and heal the sick with the touch of our hands. We don’t have to spend too much time on this. I don’t want you to get wrapped up in these verses wondering if we’re supposed to be doing all these specific miracles. (You know there are “Snake Handling Churches” who have gotten this all wrong and think we need to bring snakes to church. Others like some Pentecostal church think you aren’t a real Christian if you can’t speak in tongues.) The point is when we believe, amazing things will happen. For instance: It says we will cast our demons – I have seen men and women cast aside many demons through faith in Jesus—the demons of alcohol and drug abuse, overcoming mental illness, transformations of a selfish, egotistical spirit to one of a caring, giving spirit. Are these not true miracles in themselves? I think they are as miraculous as any exorcism we read of in the Bible. Whether or not we are talking about real demons is beside the point. Talk to anyone who has been freed from any demon—literal or metaphorical—and it won’t make any difference. Do I need to go through this whole list of miracles and explain how we see each of these actually happening? I don’t think I do, but just in case let me touch on a few. Speaking new languages—a couple years ago we took a mission team to El Salvador. None of us spoke much Spanish and Jason Denson probably spoke the least of all. And yet, Jason communicated the love of Christ to the people of El Salvador who didn't speak English with a smile, a hug, and a helping hand. Love is a NEW language. And I could go on about the miraculous power of Christ. how many of us have not sometimes had to handle "snakes" at work--people who wanted to do us harm? How many of us have visited sick people in hospitals or homes and our presence, prayers, and touch were a healing influence? Were these not miracles worthy of God's glory? The point of all this is there is remendous power in Jesus name. And when we follow our God-given purpose, we have all the power of Jesus at our disposal. My hope for you today is for you to recognize this wonderful NEW purpose Jesus gives each of us when we believe and choose to follow Him. Our NEW purpose begins to drive everything we do. You will become a better mother, a better father, a more loving wife, a more faithful husband, a better teacher, a better provider, a better employee, a better boss… You see our NEW purpose goes beyond the changing roles we have in life. It makes us more devoted in our various roles, but it also frees us to find our true identity in Christ and not in our “titles.” Whatever we do, we do it as if we are serving Christ and not people. Furthermore, everything we do becomes an opportunity to love God and love our neighbors as we Go, preach, the Good News, to Everyone. Jesus Christ has changed everything. He left the glory of heaven and came down to this corrupt world. He lived as one of us; He knows all the good, the bad, and the ugly this life can bring. He walked faithfully with God while living here on earth and taught us how to follow His path. In the end, because He loved us so much, He laid down his life on the cross to make a way for us to repent and be reconciled with God. He died and on the third day, He rose from the grave making NEW life possible—even eternal life in Heaven. Today, Jesus invites you to trust in Him--to surrender and let Him be the Lord of your life. And all who do, He will make them NEW. He will Give you a NEW heart full of godly desires. He will give you a NEW mind that thinks like Christ. He will give you a NEW purpose that guides you to live your whole life full of meaning. And ultimately, He will give you a NEW destination—even after this life on earth is over, you will be at Home with God in Heaven. Today, I have preached the Good News to you. The stakes are high. Jesus was blunt. He said, “Anyone who believes and is baptized will be saved. But anyone who refuses to believe will be condemned.” How will you respond to the Gospel today? I urge you not to put off your response. No one knows how much time they have. It may be that tomorrow will be too late. Today is the day you need to decide. Go ahead and take hold of the NEW life and NEW purpose Jesus wants you to have. I Have a NEW Mind! I was in the choir room with the choir warming up for our anthem just a few minutes ago. Sarah asked if anyone had accidentally picked up her reading glasses from the piano. Kathy, who'd just been sitting at the piano and was holding a pair of reading glasses in her hand said, "No. I promise. these are my reading glasses." Kathy's sister, Sally, said, "Uh, Kathy. You have a pair of reading glasses on your head!" Sure enough, she did! And they were the exact same style as Sarah's! Kathy Said, "I'm losing my mind!" We all had a good laugh. We use that expression, "I'm losing my mind," as a bad thing. But the truth is, if we follow Christ, we are losing our old mind and Christ is giving us a NEW mind. And that's what I want to talk about today. 1And so, dear brothers and sisters, I plead with you to give your bodies to God because of all he has done for you. Let them be a living and holy sacrifice—the kind he will find acceptable. This is truly the way to worship him. 2 Don’t copy the behavior and customs of this world, but let God transform you into a new person by changing the way you think. Then you will learn to know God’s will for you, which is good and pleasing and perfect. 3 Because of the privilege and authority God has given me, I give each of you this warning: Don’t think you are better than you really are. Be honest in your evaluation of yourselves, measuring yourselves by the faith God has given us. But Paul turns the tables on us. He invites us to leave the animals alone. Instead, he urges us to put our life on the altar. Give your own body—all that you are—as a living sacrifice. It’s not human sacrifice he is asking; it’s self-sacrifice. It’s surrendering all that you have and all that you are to the will of God. It’s an “all-in” whole-hearted proposition that is true worship—truly pleasing to God—and it changes everything. It’s what Jesus did for us, you see. Christ gave himself completely for us on the cross. He didn’t just do some good things. He didn’t just preach some great sermons. Jesus gave everything. He was whole-heartedly committed to God’s plan of salvation for you. He willingly sacrificed his entire life for you—even when it meant dying on a cross. And Christ’s sacrifice makes it is possible for us to be made NEW! We can have NEW desires, a NEW way of thinking, a NEW purpose in life, NEW peace and joy and confidence, and ultimately the promise of eternal life with a NEW heaven and a NEW earth. But in order for the NEW to come, we have to let the old die. In fact, we have to trust Jesus enough to place our old self—our old ways of thinking and living—on the altar as a sacrifice. For when you sacrifice our old life, Jesus will make you NEW! The key verse for us today is verse 2a – Don’t copy the behavior and customs of the world, but let God transform you into a new person by changing the way you think. Most of us grow up copying the behavior and customs of the world. We do the things people around us do because we think the way they do. In fact, if we ever see someone who acts or thinks in a way that in noticeably different, we might even call them weird. I know when I was in high school, I had a few friends who lived out their Christian beliefs very faithfully. At the time, I thought they were very weird because they didn’t act and talk and think the way most high school students did. They stood out. They were “weird.” At the time, I thought they should just “copy the behavior and customs” of everyone else. Now I see they were the minority that was really doing what God wanted. Now I wish I had been part of that minority when I was in high school. Now, I am—or at least I am striving to be—because I am striving to let God transform me into a NEW person. So what if it makes me different. So what if it makes me weird. If it makes me more like Christ, great! We all need to let God transform the way we think. Romans 12:3 says, “Don’t think you are better than you really are. Be honest in your evaluation of yourselves, measuring yourselves by the faith God has given us.” So let’s apply this wisdom and think clearly and honestly about ourselves. First of all, you are not the center of the world. Regardless of what the unbelieving world insinuates, the world doesn’t revolve around you. You are not entitled to “Have it your way.” Your own personal happiness is not the chief goal in life. In fact, if you faithfully follow Christ and live for God the way He intended for you, you will definitely need to give up some things you want. It is a sacrifice. (Remember how our scripture said to sacrifice yourself to God?) Following Christ means letting go of our selfish desires, our self-centered motives, and serving others instead of ourselves. This is tough for many people, but we need to let God transform our way of thinking. Some people think too highly of themselves. Others struggle with thoughts that they are not important or that they are not good enough. That’s why I like Romans 12:3 so much. It addresses both misunderstandings. It says, “Be honest in you evaluation of yourself.” And the Truth is, (though you are not the center of the world) you are very important to God. God deeply loves you. He has been working out your salvation since the beginning of time. He cared enough to send Christ to die for you. God wants you to be part of His mission to save the world. That’s pretty impressive. You must be important! So if you struggle with low self-esteem, let God transform the way you think. You are precious to Him. Do you struggle with shame or guilty? God has promised He will forgive you if you ask. No matter what you’ve done—how big or how small—God will forgive you. 1 John 1:9 says, “If we confess our sins to him, he is faithful and just to forgive us our sins and to cleanse us from all wickedness.” Shame and guilt can cripple us. It makes us hesitant in our relationship with God and others. Shame and guilt are constant burdens that weigh us down and slow us down in our spiritual life. They sap the joy God wants us to have. They can make life weary and full of worry. So if you struggle with shame or guilt, let God transform the way you think. The truth is, forgiveness is available through faith in Christ. And if you believe, God does not think about your sins anymore. They have been washed away. God says in Isaiah 1:18, “Come now, let’s settle this,” says the Lord. “Though your sins are like scarlet, I will make them as white as snow. Though they are red like crimson, I will make them as white as wool.” If you asked God to forgive you, He has. Now it’s time for you to let go of your thoughts of shame and guilt. Let God transform the way you think. Some of you may struggle with doubt. The unbelieving world says this world is all there is. Since science cannot verify the existence of an afterlife, they reject the idea as a fantasy. Since they cannot see God, they reason He is just a myth. But faith helps us see that there is more to life than just what you can see and hear and taste and touch. Faith helps us to know that Truth is more than just facts and figures. Faith helps us to see there is always hope even when all seems to be lost. Faith helps us to know that the future is ultimately in God’s hands and so, there is nothing to fear. Faith helps us to hear God’s still small voice leading us down the right path. Faith helps us to feel God’s presence when we need assurance that everything is going to be alright. Even if we lose this life, God has another waiting for us in Eternity. And all the wrongs of this world will ultimately be made right one day. It’s OK to have questions. It’s OK to have doubts. Sometimes they lead us to deeper understanding and faith. But if your doubts control you or keep you frozen with fear, maybe it’s time to let God transform the way you think. “For God has not given us a spirit of fear and timidity, but of power, love, and self-discipline.” (2 Timothy 1:7) Take hold of the power, love, and self-discipline God wants you to have. Let Him transform the way you think. As I close, I join with the Apostle Paul and plead with you, give your bodies to God as a holy and living sacrifice. Don’t hold anything back. Surrender yourself completely to the Lord and He will transform your mind.